Nothing could be further from the suit’s natural environment than a farm. So of course we wanted to get to one and get our hands dirty. We had been given a recommendation to visit an organic farm while in the East. And so it was that we did what seems to be the typically Icelandic thing; we called Eymunder as we were driving out to his farm and told him we wanted to stop by in an hour. Sure thing. Vallanes sits near a wide stretch of river at the base of a mountain range that separates the East Fjords from the interior. The place was in full swing with people planting in the fields and processing vegetables in the kitchen. Eymunder and his wife, who run the farm together, showed great Nordic stoicism when confronted by two people dressed as we are asking if they could do some work. This kind of thing must happen to them every day. Only during this journey has it become clear to me that “the suit” in The Suitable World is also a metaphor for the body. The constraints of being given one to care for (for better or worse), managing its inevitable decline and the matter of fitting in vs standing out. Thus we faced a metaphorically existential choice as we went out into the field. Yvette asked me if I was really going to get into the muddy ground and risk seriously staining the suit. But what is a body for if not to be used completely? How and where do you draw the line between preserving something you love - and using it to the fullest? Off we went, Yvette and I, compacting the earth with our boots, punching holes for the seedlings and planting rows of parsley and red-leaf lettuce. In fairness I was careful. I did not kneel in the furrow as the others did. I squatted somewhat daintily - but I did get my seedlings planted and kept pace. We then cut beets in the massive kitchen, pulling them out of giant tubs of barley husks where they had been stored. 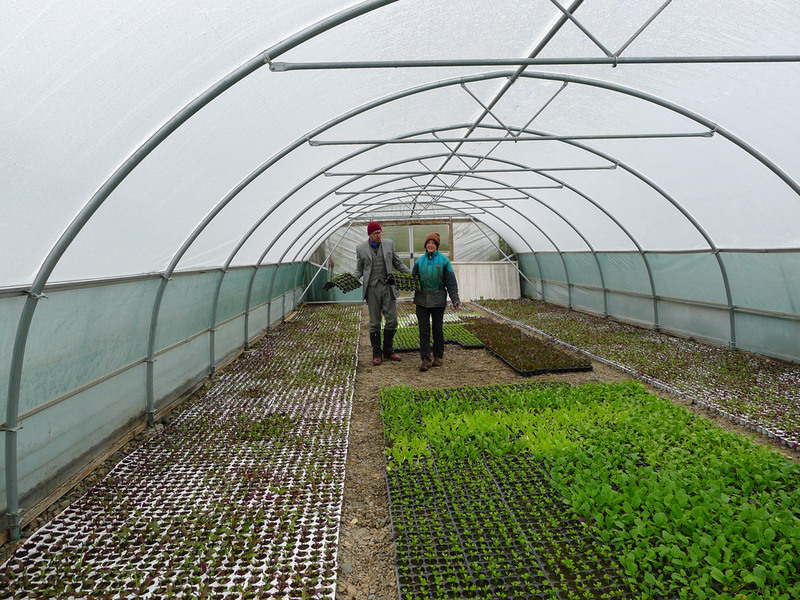 The farm is actively engaged the reforestation of Iceland (Eymunder has planted one million trees), and is part of the international WWOOF movement . Farming is elemental. All other human pursuits are luxuries granted through its largesse. So I am always slightly amazed at how often farmers we meet here are gracious and willing to get in on the act by supporting a bit of conceptual art.. Thanks to everyone at Vallanes from Yvette and I.